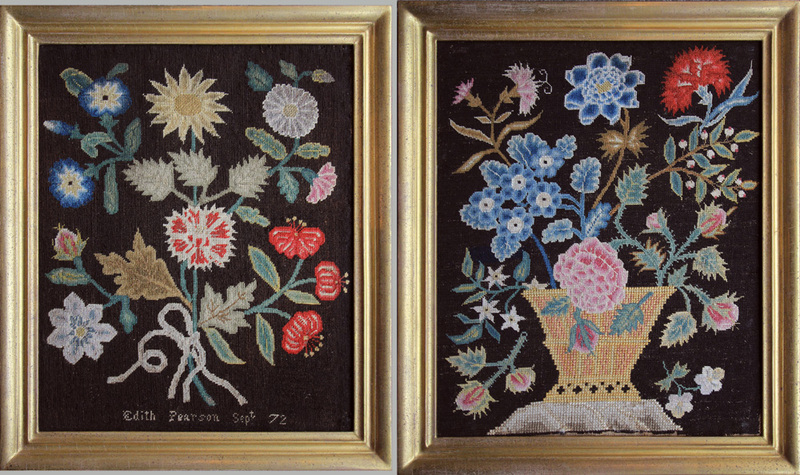 We are delighted to offer this stunning pair of fully worked, tent stitch pictures, each featuring flower arrangements that fill their space and contrast spectacularly with their rich, black-brown solidly worked field. The needleworker, Edith Pearson, used both wool and silk in a strongly colored palette; her highly-detailed buds and blossoms, shaded and veined leaves and thorny stems create compositions with strong appeal. Using, for the signed example, an off-center bowknot to hold the bouquet together and a basket sitting on rhythmic low hills for the other, these two pictures work beautifully with one another and fortunately have remained together for all these years. For a similar, singular, example, refer to figure 206 in Art of Embroidery: History of Style and Technique by Lanto Synge (The Royal School of Needlework, 2001). Worked in wool and silk on linen, they are in excellent condition with very minor stitch loss. They have been conservation mounted and are in gold leaf frames.